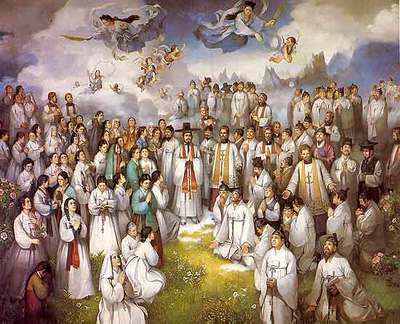 The Feast of All Saints is a holy day of the Church honoring all saints, known and unknown. While we have information about many saints, and we honor them on specific days, there are many unknown or unsung saints, who may have been forgotten, or never been specifically honored. On All Saints Day, we celebrate these saints of the Lord, and ask for their prayers and intercessions. The whole concept of All Saints Day is tied in with the concept of the Communion of Saints. This is the belief that all of God’s people, on heaven, earth, and in the state of purification (called Purgatory), are connected in a communion. In other words, the saints of God are just as alive as you and I, and are constantly interceding on our behalf. Remember, our connection with the saints in heaven is one grounded in a tight-knit communion. The saints are not divine, nor omnipresent or omniscient. However, because of our common communion with and through Jesus Christ, our prayers are joined with the heavenly community of Christians. 1. Isn’t Celebrating All Saints Day Idolatry? Many non-Catholics, especially those from more fundamentalist backgrounds, assume that celebrating the saints means somehow worshiping them. This leads some Christians to claim that All Saints Day is an idolatrous holiday. The Church, East and West, has always distinguished between worship (latria), given to God alone, and veneration (dulia), which may be given to the saints. The highest form of veneration (hyperdulia) is due to the Blessed Virgin Mary. If someone is treating a saint as one should treat God, then yes, that is idolatry. That being said, Catholics believe that the saints have a role in our lives, as intercessors on our behalf, because we are all united by our communion in Christ. The saints are continually praying for us and interceding on our behalf, on account of their closeness to Christ. This is because God is the God of the living, not of the dead. As such, asking a saint for intercession is no more idolatrous than asking a holy friend or pastor to pray for you. Remembering and honoring the saints are beneficial practices, because to remember the heroes of the faith and follow their examples are good things. Many Christians seem to strongly oppose remembering and celebrating the lives of great Christian men and women, yet have no problem celebrating the lives of secular heroes like George Washington. All Saints Day is kind of like a Christian Memorial Day or Presidents Day, a day to celebrate the lives of all the great heroes of the Christian faith, and to celebrate the deep communion we have with them. While celebrating secular heroes is admirable, how much more admirable is celebrating those who fully dedicated their lives to Christ! 2. Don’t Catholics pray to Saints? Yes, Catholics do pray to saints, on All Saints Day, and throughout the year. However, we must remember what the word “pray” means. It simply means to make a request. If you examine common prayers to the saints, these prayers ask the saints to pray for us, and entreat them, by their examples and prayers, to lead us closer to Christ. Thus prayers (requests) to the Trinity, and prayers (requests) to the saints are very different in content and style, and should not be confused. Praying to (making a request of) a saint is like making a request of your pastor. When you need it, you probably ask your pastor to pray for you because you know he is a deep and prayerful man, and you would like his prayers. All Christians recognize that God hears the prayers of his people, and we find comfort in the prayers of those who are close to Christ. This is why we pray to the saints.